1. 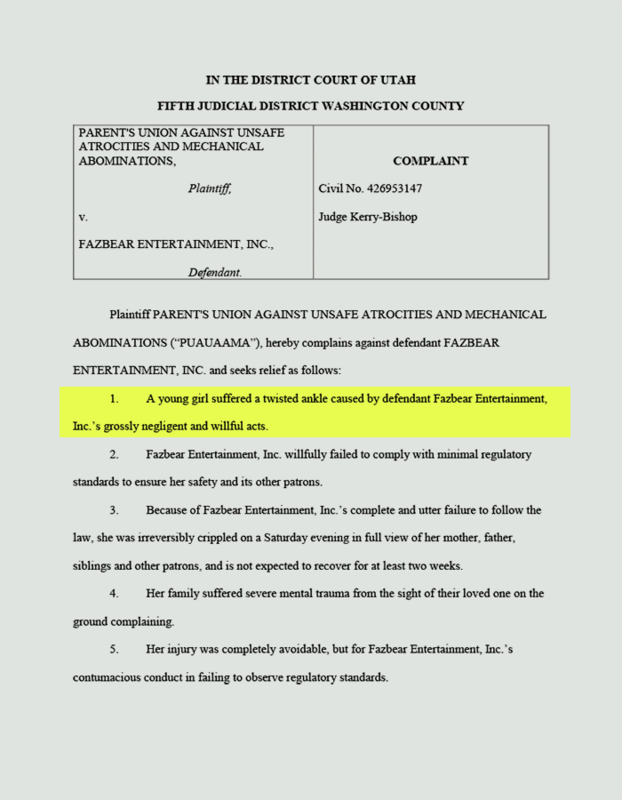 A young boy suffered extreme personal injury and emotional distress at an establishment owned by defendant Fazbear Entertainment, Inc.
2. He experienced a two-day bout of food poisoning. 3. He also suffered grievous mental trauma at the sight of his friends having fun while he felt sick. 4. His injuries are a direct result of Fazbear Entertainment, Inc.’s grossly negligent preparation of food, including substandard hygienic practices. 5. 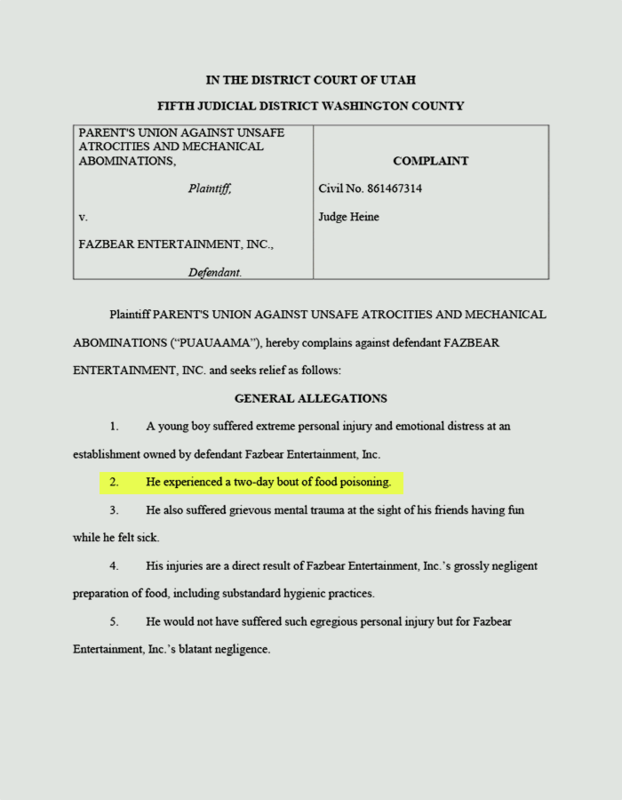 He would not have suffered such egregious personal injury but for Fazbear Entertainment, Inc.’s blatant negligence. 1. 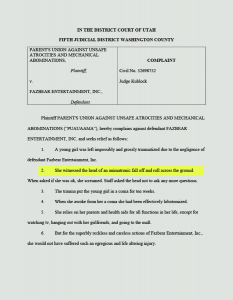 A young girl suffered a twisted ankle caused by defendant Fazbear Entertainment, Inc.’s grossly negligent and willful acts. 2. 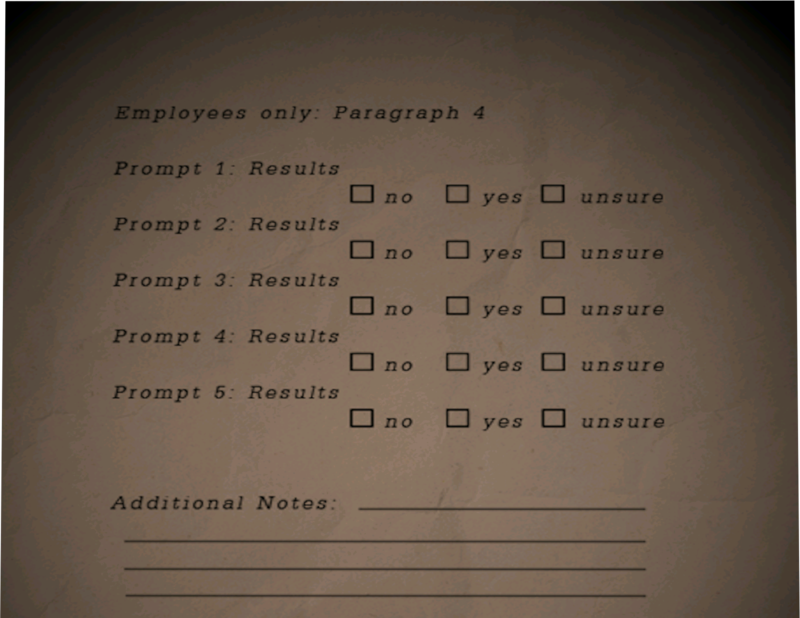 Fazbear Entertainment, Inc. willfully failed to comply with minimal regulatory standards to ensure her safety and its other patrons. 3. 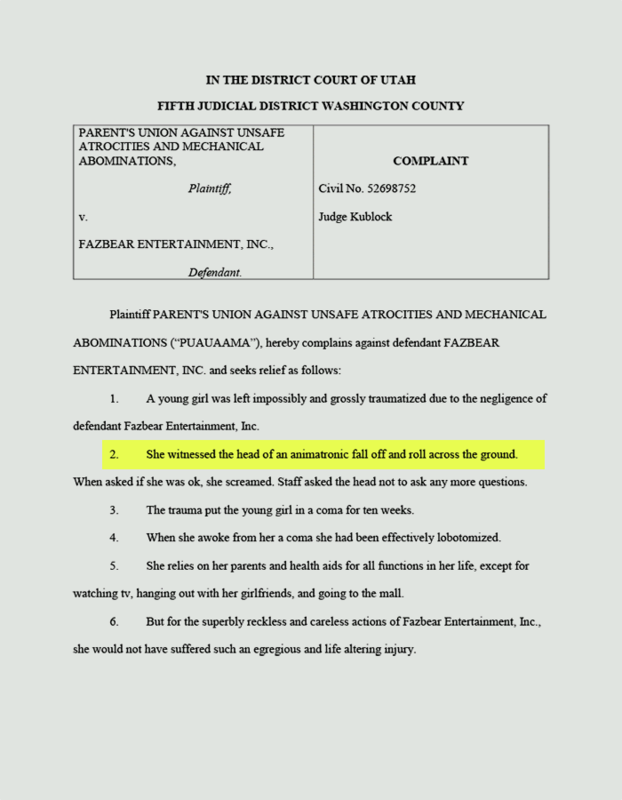 Because of Fazbear Entertainment, Inc.’s complete and utter failure to follow the law, she was irreversibly crippled on a Saturday evening in full view of her mother, father, siblings and other patrons, and is not expected to recover for at least two weeks. 4. Her family suffered severe mental trauma from the sight of their loved one on the ground complaining. 5. 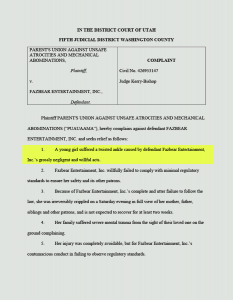 Her injury was completely avoidable, but for Fazbear Entertainment, Inc.’s contumacious conduct in failing to observe regulatory standards. 1. 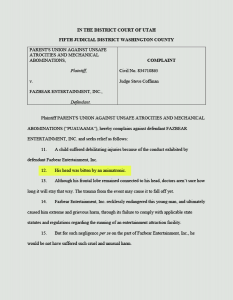 A young boy suffered a concussion as a result of the reckless behavior exhibited by defendant Fazbear Entertainment, Inc.
2. He complained and whined for several long hours after patronizing an establishment owned and operated by Fazbear Entertainment, Inc.
3. An attraction struck him in the head at Fazbear Entertainment, Inc.’s establishment. 4. After crying inconsolably for several minutes, he left, and took his pizza. 5. He later said he was too upset to eat it. 6. He threw it away. What a waste. 1. 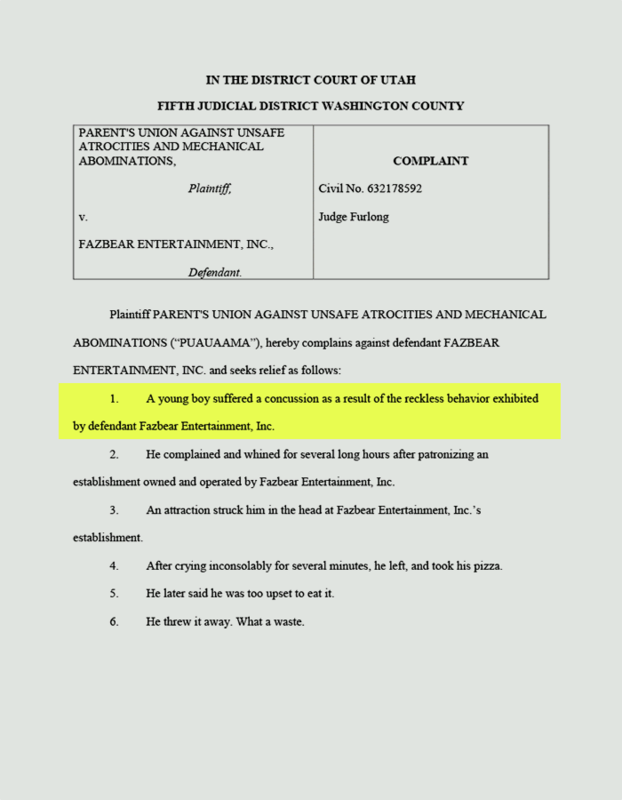 A young girl was left impossibly and grossly traumatized due to the negligence of defendant Fazbear Entertainment, Inc.
2. She witnessed the head of an animatronic fall off and roll across the ground. When asked if she was ok, she screamed. Staff asked the head not to ask any more questions. 3. The trauma put the young girl into a coma for ten weeks. 4. When she awoke from her a coma she had been effectively lobotomized. 5. She relies on her parents and health aids for all functions in her life, except for watching tv, hanging out with her girlfriends, and going to the mall. 6. But for the superbly reckless and careless actions of Fazbear Entertainment, Inc., she would not have suffered such an egregious and life altering injury. 1. A young girl was utterly and horrifically disfigured by the reckless endangerment exhibited by defendant Fazbear Entertainment, Inc.
2. While patronizing Fazbear Entertainment, Inc.’s wholly owned and operated establishment, her index finger was broken due to the establishment’s failure to install necessary and approved safety apparatuses. 3. The child has suffered immense pain and suffering from her inability to ever play “Itsy Bitsy Spider” again. 4. But for the callous indifference Fazbear Entertainment, Inc.’s has shown to safety standards, her digits would all be intact, and the Spider could go up the spout again. 1. 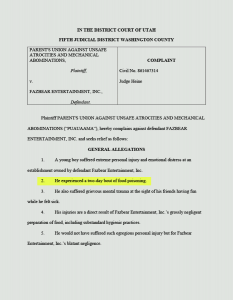 A young boy was hospitalized for ten months due to defendant Fazbear Entertainment, Inc.’s negligent preparation and handling of foodstuffs. 2. 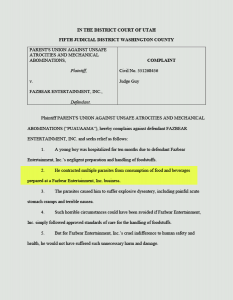 He contracted multiple parasites from consumption of food and beverages prepared at a Fazbear Entertainment, Inc. business. 3. The parasites caused him to suffer explosive dysentery, including painful acute stomach cramps and terrible nausea. 4. Such horrible circumstances could have been avoided if Fazbear Entertainment, Inc. simply followed approved standards of care for the handling of foodstuffs. 5. 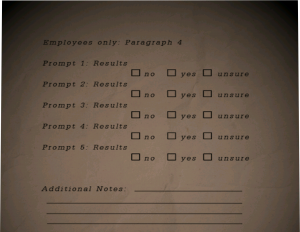 But for Fazbear Entertainment, Inc.’s cruel indifference to human safety and health, he would not have suffered such unnecessary harm and damage. 1. 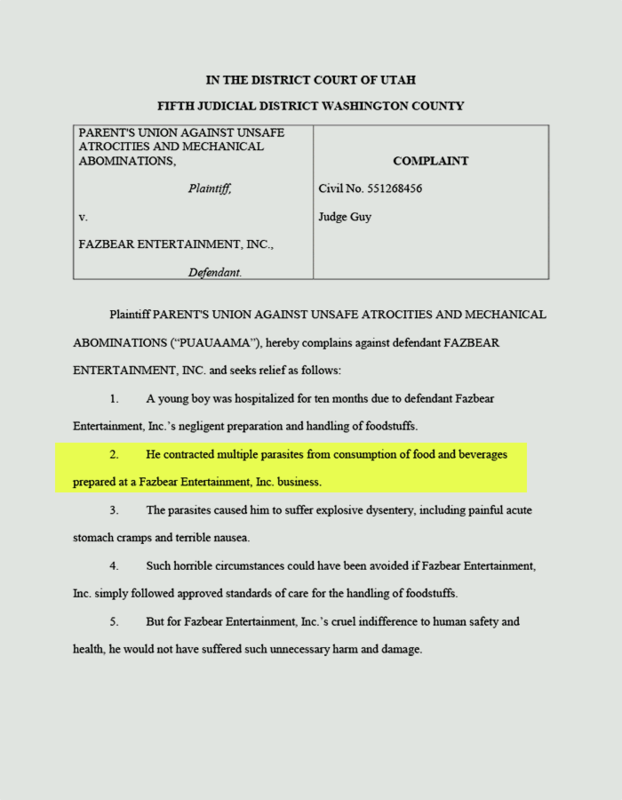 A young boy suffered severe mental trauma because of defendant Fazvear Entertainment, Inc.’s cold-hearted indifference to the health and wellbeing of the human population. 2. While attempting to enjoy a day and frolic at a Fazbear Entertainment, Inc. establishment, he became trapped and encased in a small confined area after the ground gave way beneath him. 3. Fazbear Entertainment, Inc.’s complete lack of maintenance and upkeep lead to the unstable ground upon which he walked and fell. 4. He was trapped in a cold, wet, damp and dark enclosed space for nearly thirteen hours. Pizza and party favours had to be lowered down to him. 5. Based on this experience, he has developed a debilitating fear of the dark, and anchovies. 1. 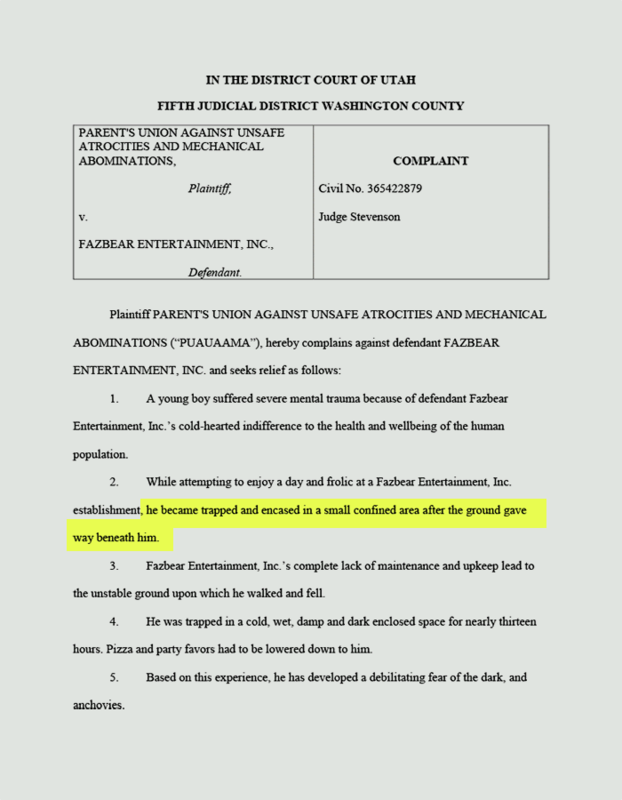 A young boy suffered debilitating external and internal injuries because of the conduct exhibited by defendant Fazbear Entertainment, Inc.
2. He broke one-hundred (100) bones and suffered severe internal bleeding while patronizing Fazbear Entertainment, Inc.
3. Although he didn’t notice his broken bones until he got home, his parents believe Fazbear Entertainment should still answer for his injuries. 4. 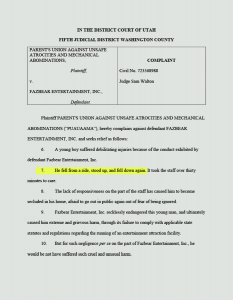 Fazbear Entertainment, Inc. recklessly endangered this young man, and ultimately caused him extreme and grievous harm, through its failure to comply with applicable state statutes and regulations regarding the running of an entertainment attraction facility. 5. 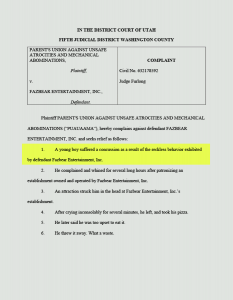 But for such negligence per se on the part of Fazbear Entertainment, Inc., he would be not have suffered such cruel and unusual harm. 6. 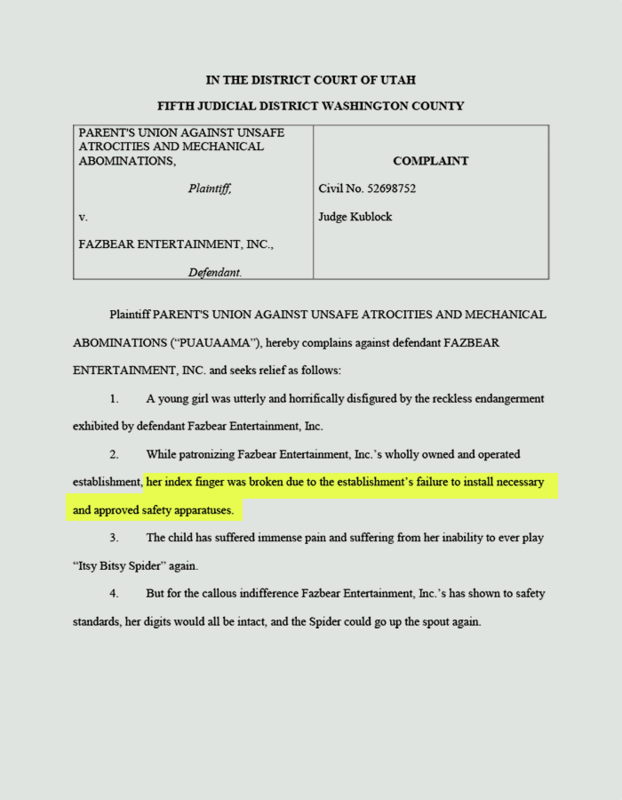 A young boy suffered debilitating injuries because of the conduct exhibited by defendant Fazbear Entertainment, Inc.
7. He fell from a ride, stood up, and fell down again. It took the staff over thirty minutes to care. 8. The lack of responsiveness on the part of the staff has caused him to become secluded in his home, afraid to go out in public again out of fear of being ignored. 9. 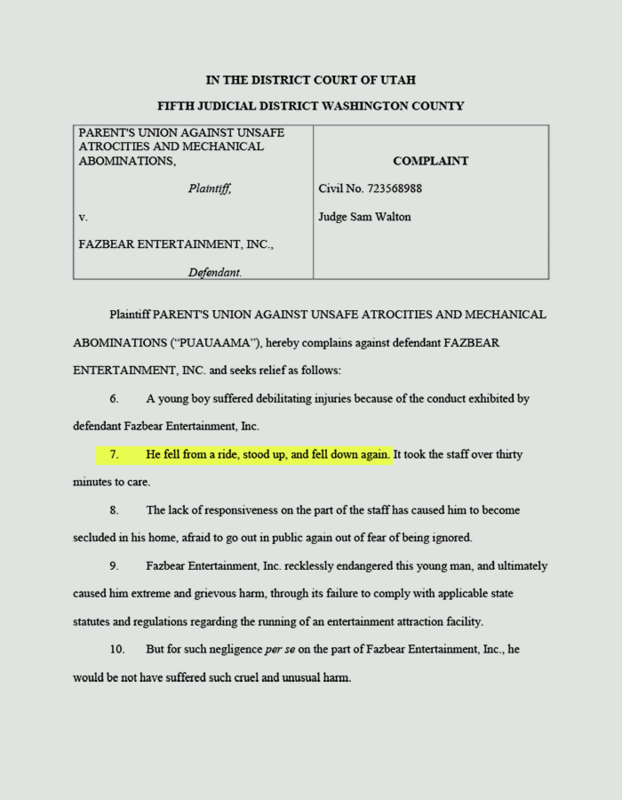 Fazbear Entertainment, Inc. rechlessly endangered this young man, and ultimately caused him extreme and grievous harm, though its failure to comply with applicable state statutes and regulations regarding the running of an entertainment attraction facility. 10. But for such negligence per se on the part of Fazbear Entertainment, Inc., he would be not have suffered such cruel and unusual harm. 11. 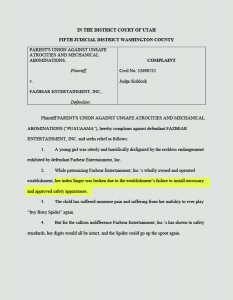 A child suffered debilitating injuries because of the conduct exhibited by defendant Fazbear Entertainment, Inc.
12. His head was bitten by an animatronic. 13. Although his frontal lobe remained connected to his head, doctors aren’t sure how long it will stay that way. The trauma from the event may cause it to fall off yet. 14. 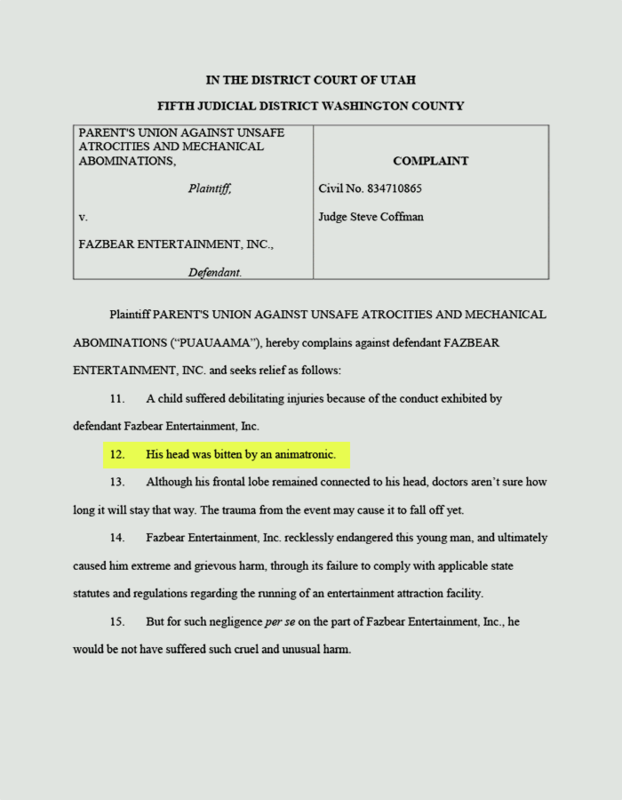 Fazbear Entertainment, Inc. rechlessly endangered this young man, and ultimately caused him extreme and grievous harm, though its failure to comply with applicable state statutes and regulations regarding the running of an entertainment attraction facility. 15. But for such negligence per se on the part of Fazbear Entertainment, Inc., he would be not have suffered such cruel and unusual harm.